Does your job involve hot works – such as welding, the use of oxy/gas equipment and acetylene, cutting operations and air-arc gouging? If so, in this guest post from Riskatmedia, you’ll find ten tips to help you stay safe. Before carrying out unavoidable manual handling activity, you should help to protect yourself from injury by following good manual handling practices. (You can learn the basics on a one-day manual handling awareness course, or you could train the trainer to pass these skills on back at the workplace). Consider the task to be carried out and the nature of the load, and be aware of your own capabilities and the environment in which you are working. In particular, portable welding equipment, gas cylinders and work pieces can be extremely heavy and you should give consideration to safe manual handling practices before undertaking any job that involves lifting these items. 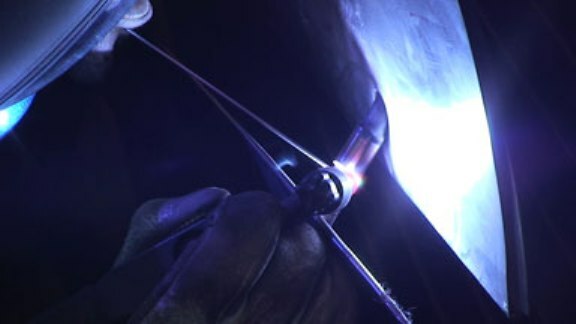 The use of Argon gas during TIG welding increases the visible brightness of the Arc. Slips and trips can result from contamination, obstacles, inappropriate footwear, reduced visibility, the environment and people’s attitudes. Good housekeeping can significantly reduce the risk of serious slip and trip injuries. Containing spent rod ends and removing debris, slag, packaging and other waste materials to waste skips. You can also reduce the risk of slips and trips by properly routing any cables or air hoses that you use. 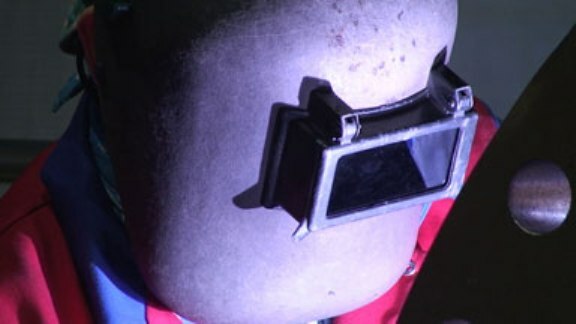 A safe place of work should be established to take into account the restricted visibility resulting from welders wearing protective head-shields. Consider whether the environment in which you will be working increases the risk of slips and trips and take responsibility for your own and your colleagues safety by appropriately containing any spills that you might discover. 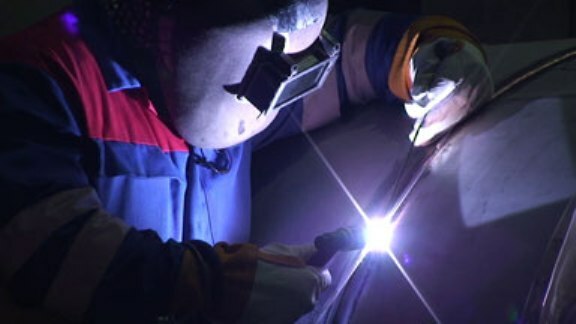 Welding can cause hot work surfaces which can result in plant damage or burns. Electric shock from welding equipment can result in death or severe burns. Serious injury can result if the welder falls as a result of the shock. To prevent the risks posed by electrical hazards, all equipment should be tested and certified before use. Air pipe work should be checked to ensure that there is no electrical conductivity between the ends and the welding return cable should be connected as close as possible to the work piece. The electro-magnetic field produced by certain types of welding equipment may pose a risk to welders who have implantable medical devices fitted. Please make sure that you have informed your supervisor if you have an active implantable medical device, and talk to your doctor about the safety of using welding equipment in relation to your medical device. Welding and allied processes produce molten metal, sparks, slag and hot work surfaces which pose a risk of fire and explosion, and which can result in fatalities, serious injury and plant damage. Flying sparks are the main cause of fire and explosion, especially as sparks can travel up to 10 metres from the work space. Sparks and molten metal can travel even greater distances when falling and can pass through and become lodged in cracks, clothing, pipe holes and other small openings. To reduce the risk of fire and explosion when carrying out Hot Works, a permit for work should be obtained before commencing work on any operational plant. Working areas and the areas below them should be kept free of combustible material. Fixed items of plant, such as installed electrical cables should be protected by a fire blanket. Sparks should be contained by means of a non-flammable material. Fire extinguishers should be close at hand, and the working area should be inspected when work is suspended to ensure there is no residual risk of fire or explosion. Flying sparks are the main cause of fire and explosion. Additional precautions are necessary when working with oxy-gas equipment. Gas bottles should be in an upright position, secured to prevent falling and located in an open aspect during use. The cylinder valves should be kept shut while hoses and equipment are being connected or disconnected. The requirement to fit flash back arrestors to both hoses is mandatory, but you should also ensure that you have enough gas in both cylinders to complete the job and that you follow the manufacturer’s guidelines for proper shut-down and start-up procedures for the equipment you are using to reduce the risk of flashbacks. The bottle key should be kept on the valves while equipment is in use to enable quick shut off in the event of an emergency. A fire watch should be maintained during operations. All gas cylinders should be isolated when not in use to prevent oxygen or gas enrichment. And all operators should subject oxy-gas equipment to daily pre-use checks, such as leak detector spray or pressure drop tests. Contamination of gas cylinders by oil or grease should be avoided, as this may increase the risk of fire and explosion. Direct exposure to fire can initiate a heat generating decomposition reaction within acetylene gas leading to the potential for explosion. Any cylinders exposed to a fire should therefore be isolated for at least 48 hours, or until deemed safe. When not in use, gas cylinders should be stored in properly constructed and ventilated cages, with no source of ignition within three metres. Most welding and related activities produce significant quantities of non-ionising radiation, such as visible light, ultraviolet and infra-red, which can cause eye damage and painful skin burns. The intensity and wavelength of energy produced depends on the process, welding parameters, electrode and base metal composition, fluxes, and any coatings or plating on the base material. Ultraviolet radiation increases approximately as the square of the welding current. Visible brightness or luminance of the arc increases at a much lower rate. Processes using argon produce larger amounts of ultraviolet radiation than those using most other shielding gases. The risk of injury to the operator resulting from exposure to non-ionising radiation can be reduced by decreasing the length of exposure, wearing a head shield and standard Personal Protective Equipment or PPE with gauntlets and Proban fire-retardant overalls. Consider the restricted visibility caused by protective head shields. Many welding processes produce fumes which are potentially harmful. Depending on the materials involved, the ill effects can include irritation of the eyes, skin and respiratory system, or more severe complications such as impairment of speech and movement. Symptoms of over-exposure to welding fumes may manifest immediately or some considerable time later. To reduce these risks, position the work area with an open aspect to minimise fume concentrations. Use forced ventilation where necessary and, in confined spaces, an air fed hood. Use a disposable mask appropriate to the type of fumes produced during work operations, and remember that respirators are mandatory for stainless steel welding. It is also important to refer to the relevant Hazardous Material Assessment which will outline additional safe working practices for the materials used. Where cutting operations are performed, it is always important to give consideration to the effect that these operations will have on the stability of the work piece. In particular, consideration should be given to weight distribution, as the removal of significant weights may alter the balance of the work piece. Where appropriate, the work piece should be supported. You should also plan how items that have been removed will be lowered without risk to yourself, to others who may be working nearby, or to equipment. In the event of an emergency, conduct an initial assessment of the situation. If you believe that the situation is beyond your control, evacuate the area immediately. Turn off all valves, but only if it is safe to do so. If the flame from a leak cannot be extinguished by turning off the valve, do not stay and attempt to fight the fire. Evacuate the area immediately. Thanks to Riskatmedia Safety Videos for this guest post. Anything you’d like to add, or any questions? If so, please leave your comments below.